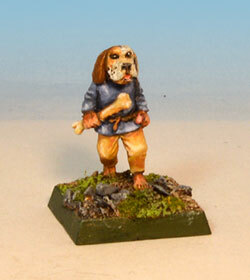 Bonzo the dog-faced boy was originally made for the Oldhammer 2016 Chaos villagers project. Everyone enters a model and then one lucky winner gets the lot. Bonzo never made it, because I mislaid him until long after the competition had ended. Here’s the Forum post, where you can see lots of other weird and wonderful creations. The model was converted from a Black Tree Design villager child, with a green stuff head. 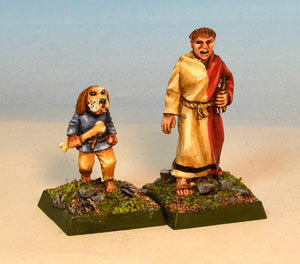 He was carrying a small, toy sword, which I altered into a bone to build on the ‘dog’ theme. You can see just how small he is when compared to this Black Tree monk. Sorry to say I’ve only just found your blog – well impressed by it and your stuff.